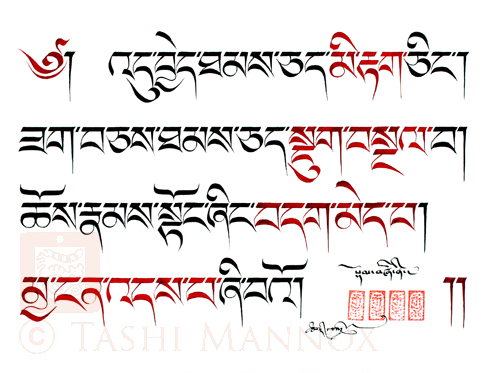 A new rendition of "The Heart of Emptiness"
The Heart Sutra and its mantra, nick named the Gaté mantra, is a continued inspiration for a number of Tashi's art pieces over the years. 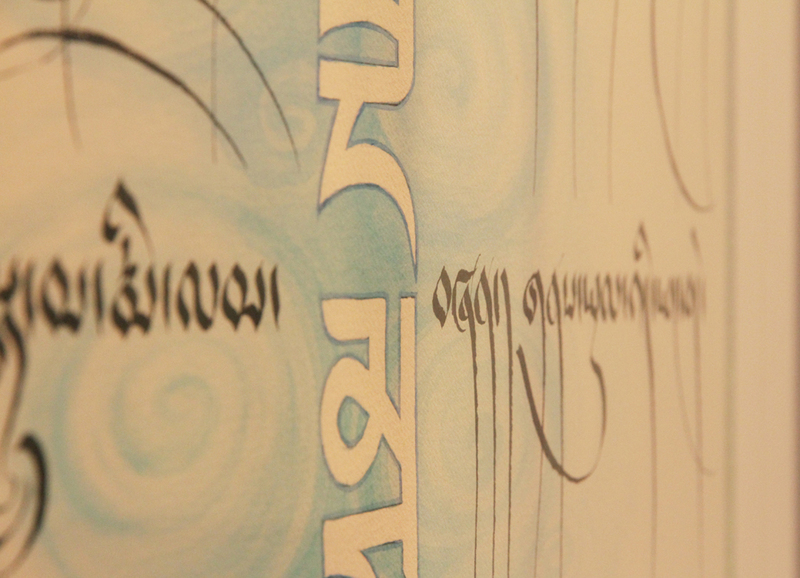 Recently Tashi was commissioned to create two new calligraphy pieces based on earlier artworks he had created. This following post tells something of the techniques used to create these masterpieces and the challenge in capturing their subtle qualities photographically in order to replicate as giclée prints. 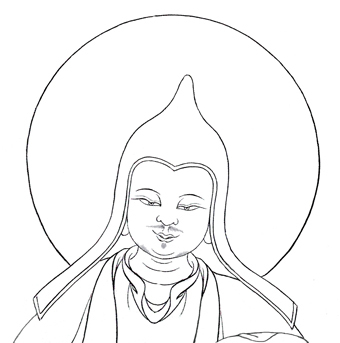 In reference to the above image "The Heart of Emptiness". 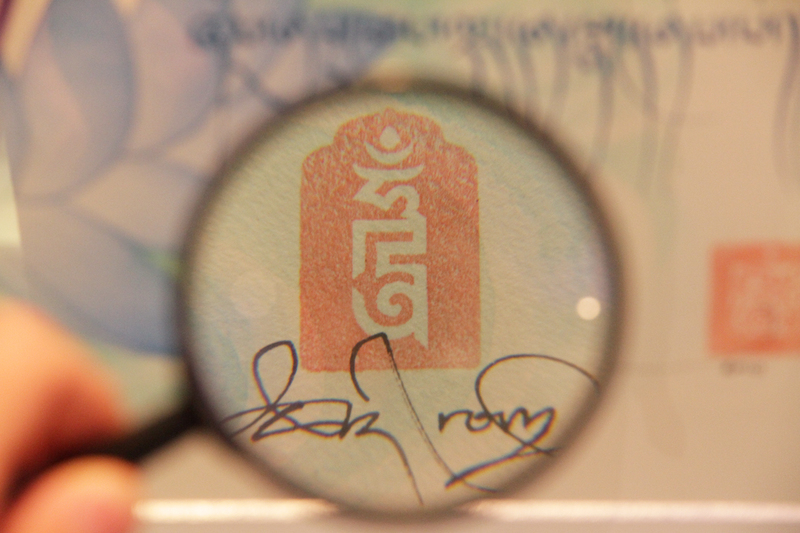 The central 'empty space of natural paper' is created by the Gaté mantra: "om gaté gaté para gaté para sam gaté bodhi swaha" encircling anti-clockwise, though to read the mantra from a stationary point (starting at the bottom) the mantra/paper would turn clockwise. The tails of the letters extend out into the darkness of space, whereas the vowel signs that sit above the letters are unavoidably left within the empty white space. 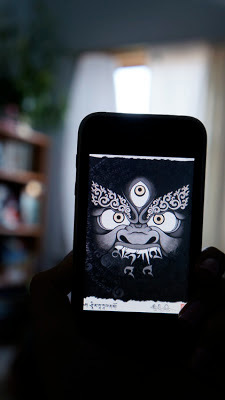 Across the whole of the black background is painted in another layer of black ink an extract from the Heart Sutra. "The Heart of Emptiness" is available as a limited edition print, please follow this link. To begin with there is a fair amount of estimated guess work to fathom the right size length of text to fit in complete circle harmoniously within the limited size of the paper. In the case of creating a circular Gaté mantra, three attempts were made that are shown as a collection of studies below. These four studies on about A2 size water-colour paper can be viewed as individual art pieces here. Only once the right size lettering is found to complete the right size circle of text; can this be applied with held breath to the actual artwork, such as "The Heart of Emptiness". 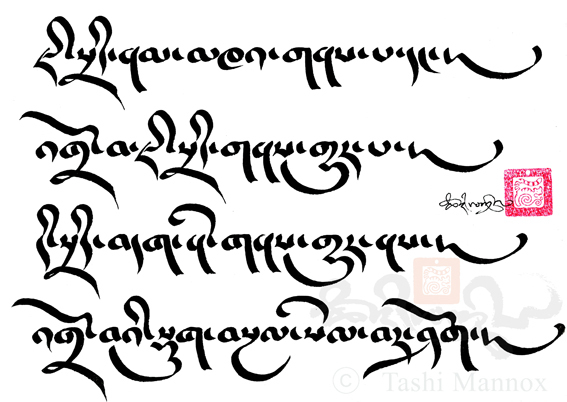 Another art piece inspired by the Heart Sutra shown below is called "None Attainment"that highlights one of the aspects taught through the Heart Sutra that expresses 'no concept' of anything that has 'gone beyond'. 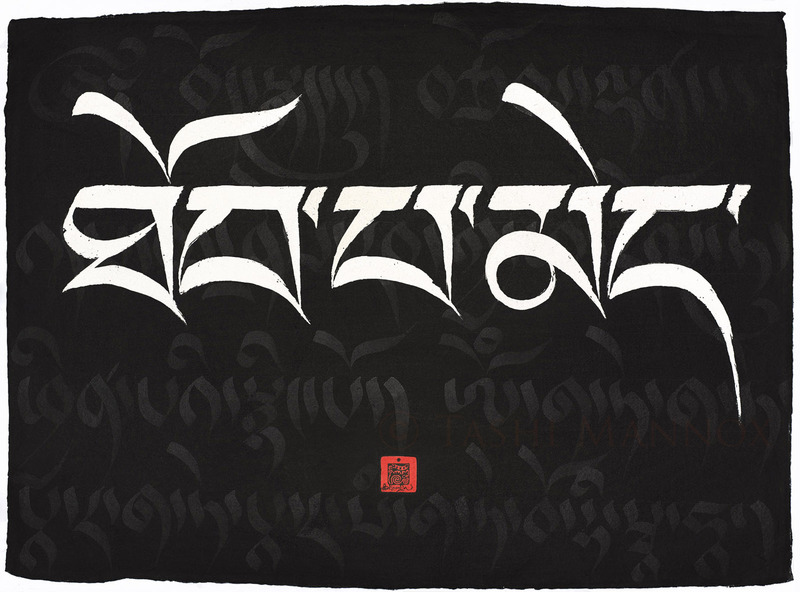 The artwork depicts the words 'no attainment' in white lettering that appears to shine out over the black background where hidden is the title of the Heart Sutra as well as its mantra. 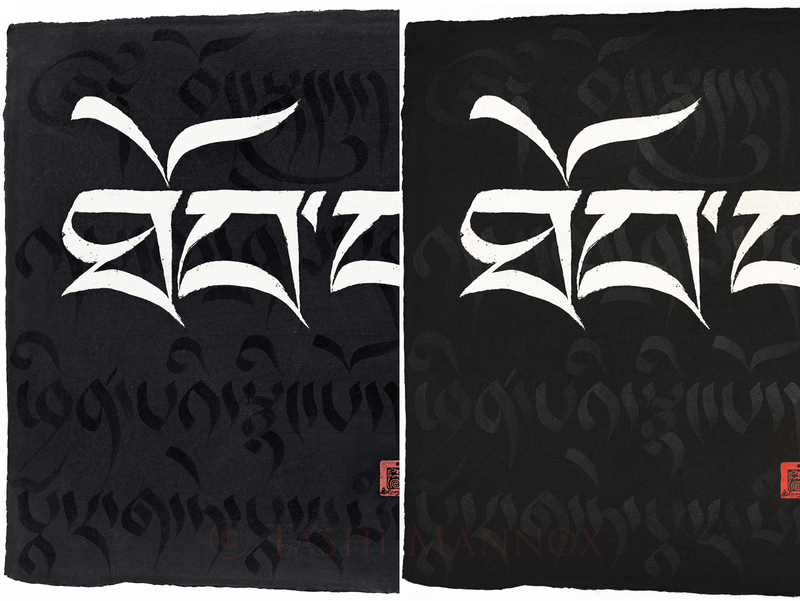 A new rendition of "None Attainment"
Both pieces; "The Heart of Emptiness" and "None Attainment" belong to Tashi's 'Black on Black' series that explores the coined technique of painting black calligraphy on black background, the effect of which gives a mysterious half hidden calligraphy that can be picked out because of the reflective quality of the ink. Such reflective qualities are problematic to photograph because only one of the reflective moods can be captured at any one time dependent on how the image is lit. 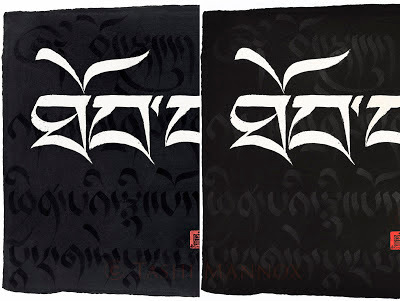 The below examples shows two very different ways in which the black on black calligraphy and background is exposed. In other light condition the background lettering can seen to disappear altogether. On the left side image the photograph has picked up the lettering as black with the background more reflective and a lighter tone. On the right side the lettering is reflecting lighter the black background completely inverted to the image on the left. When reproduced as prints, that is totally reliant on the quality of the photograph, the subtle reflective quality that reveals its self when viewing the original art work, is somewhat limited in the print productions, never-the-less they still stand as strong printed artworks in their own right. 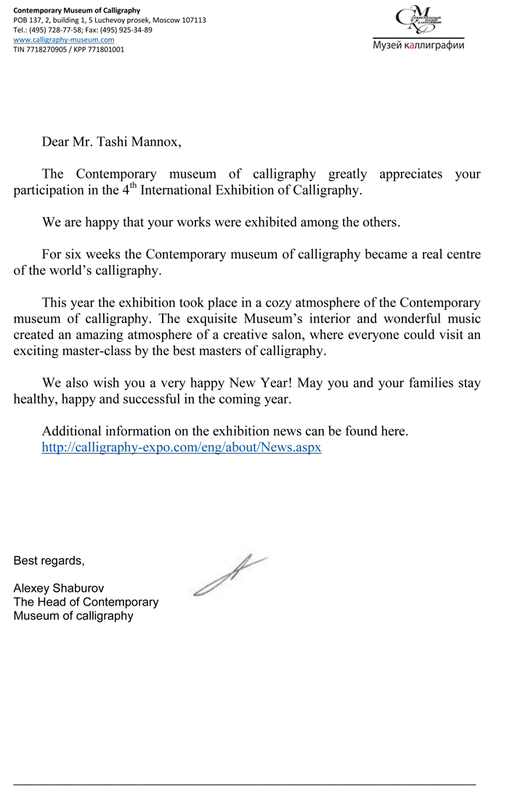 Once again the Russian Federation hosts the worlds foremost exhibition of contemporary calligraphy in Moscow. 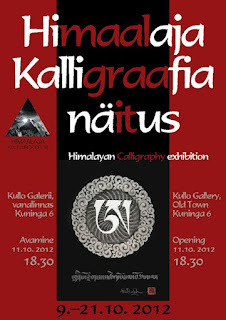 This 2012 biannual event runs between 1st November until the 15th December. 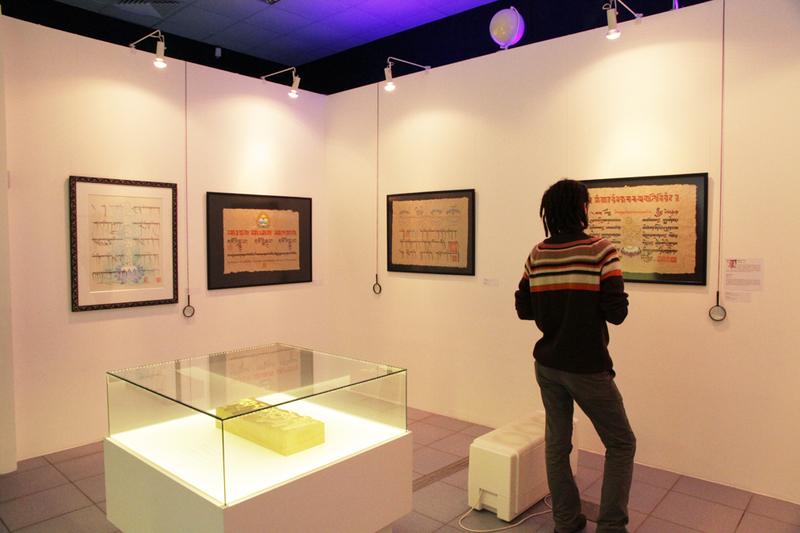 A diverse and colourful exhibition that represents over 40 world class calligraphy artists of different language traditions, who have contributed calligraphic masterpieces to celebrate the beauty of handwriting, excelling their artistic abilities in the name of keeping such calligraphy traditions alive. The exhibition officially opened on the 1st November with a grand event that attracted much media attention as captured here. Please click on the link here to view the full exhibition catalog. There is also a 'virtual excursion' that allows remote live viewing of the exhibition via CCTV cameras placed strategically around the gallery halls. Please follow the link here to view the exhibition live. 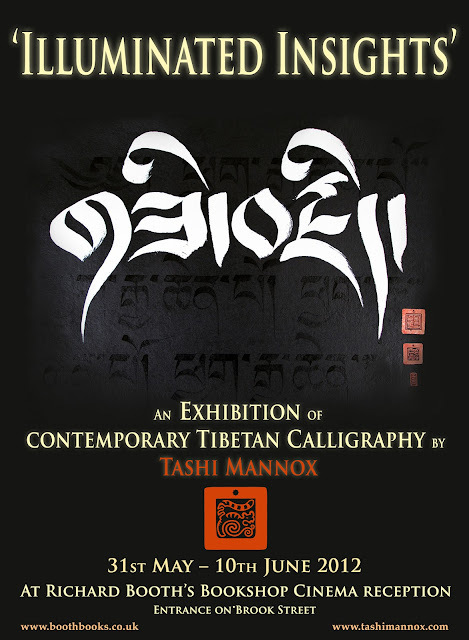 Since the Contemporary Calligraphy Museum of Moscow first held their international calligraphy exhibition in 2008, Tashi Mannox has been invited to exhibit with three of their biennials. 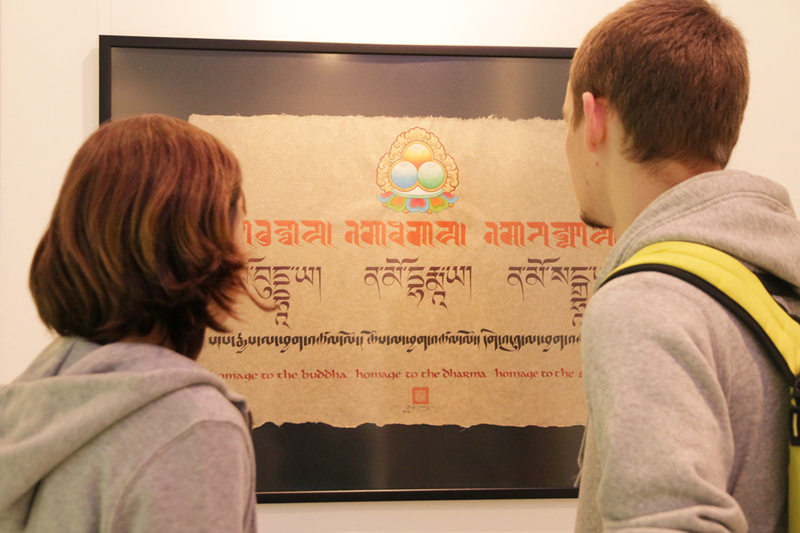 This year Tashi especially created two art pieces and donated a third for the 2012 show. One such piece especially created, as shown in the above snap-shot of the catalog, called "Homage to the Three Jewels" can also be seen with a more detailed explanation in a previous blog post here. The other calligraphy art piece exclusively created for Moscow is called "The Four Immeasurable States" (as below) another calligraphy based on a classical Buddhist theme and popular for a strongly growing Buddhist community in Russia. 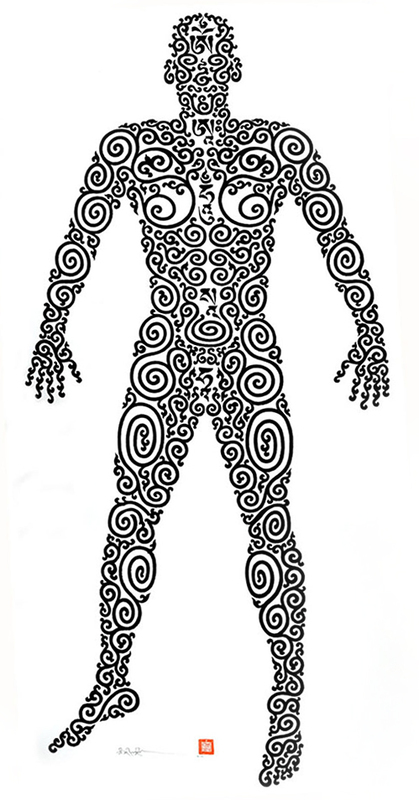 57x84cm ⓒ Tashi Mannox 2012. Translation by Lama Shepen Hookham at the request of Tashi Mannox June 2011. The below photos taken at the 4th International Exhibition of calligraphy showing four of Tashi's artworks displayed among other calligraphy traditions, such as Islamic and classical Chinese. "Seven line prayer to Guru Rinpoche"
"Homage to the Three Jewels"
"Sacred Mantra" and "Homage to the Three Jewels"
Up close.... Visitors during the official opening of the IV International Exhibition of Calligraphy 2012, take in detail of one of Tashi's earlier art pieces called "Sacred Mantra" donated to the Moscow Contemporary Calligraphy Museum in 2010. In June this year 2012, Tashi was contacted by a Tibetan man called Yeshi who lives in the Eastern Tibetan/Chinese Provence of Yunnan. 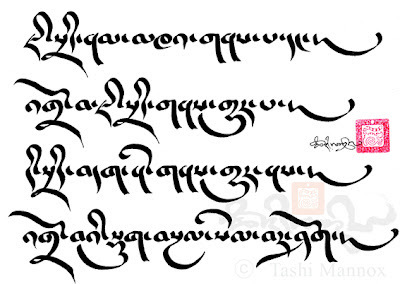 So eager was Yeshi to commission Tashi to create a calligraphy, he made a long distance phone-call from the capital Kunming to discuss the phrases Yeshi wanted in the Khyug (quick style) Tibetan calligraphy. The chosen phrases was a four line stanza to generate a mind of Enlightenment (as below), originally composed by the great Indian scholar Shantideva, who was the author of some of the greatest Buddhist works, such as the Bodhicharyavatara. "For as long as space exists and living beings endure. 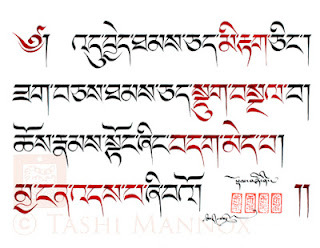 May i too remain to dispel the misery of the world"
The phone-call and request was somewhat of a surprise to Tashi, who asked Yeshi why he needed to ask an Englishman half way around the world to create a Tibetan calligraphy to send back to Tibet and surely their must be somebody more local to him, such as a Lama who could elegantly scribe the stanza. 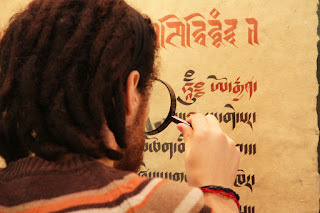 Yeshi replied that it was very difficult to find a person who is able because the Tibetan written language was little practiced and much forgotten. 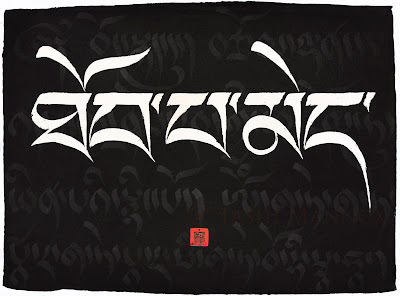 Above is Yeshi, proudly wearing his new tattoo, that is important to him representing the Tibetan heritage he belongs, as well as the wisdom in it's meaning of Bodhicitta; poetically expressed in the calligraphy that is topped with a crescent moon and Bindu like sun, inspired by another of Tashi's iconic artworks called "Precious Human Existence". 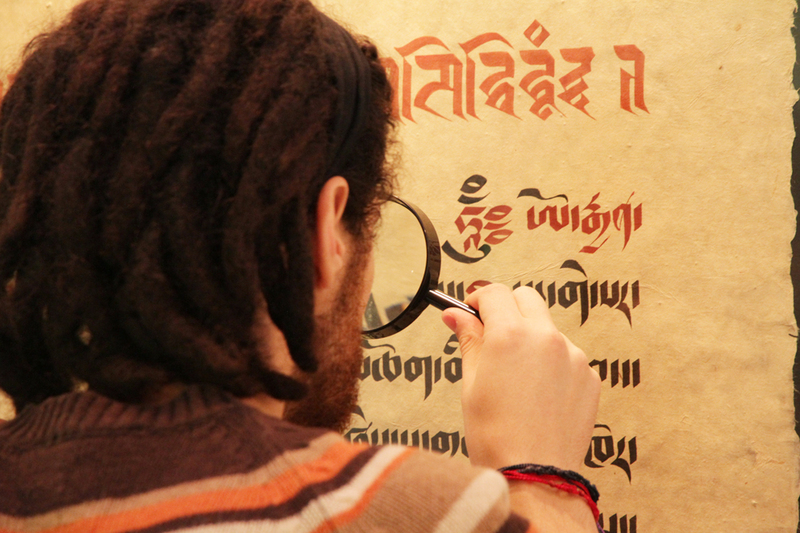 The conservation of the Tibetan written language and its many script styles is at the heart of Tashi's work as a contemporary Tibetan calligraphy artist. 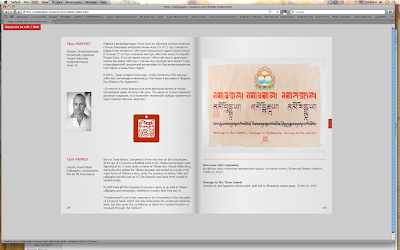 "Ancient traditions take many generations to develop and mature. 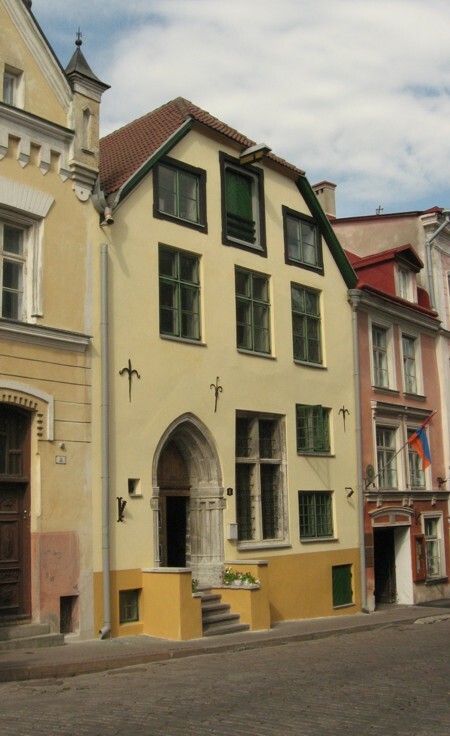 However with neglect, such traditions can easily be lost in just one generation. 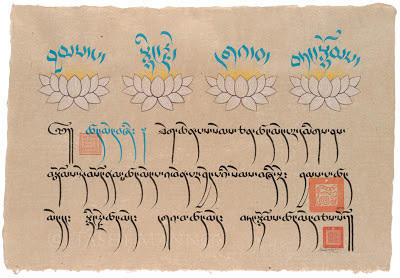 Documentation and reproduction is essential for their survival in keeping the ancient traditions alive"
This triptych depicts a lotus flower in stages of bud to bloom to seedpod, representing the passing of time ‘past, present and future’. 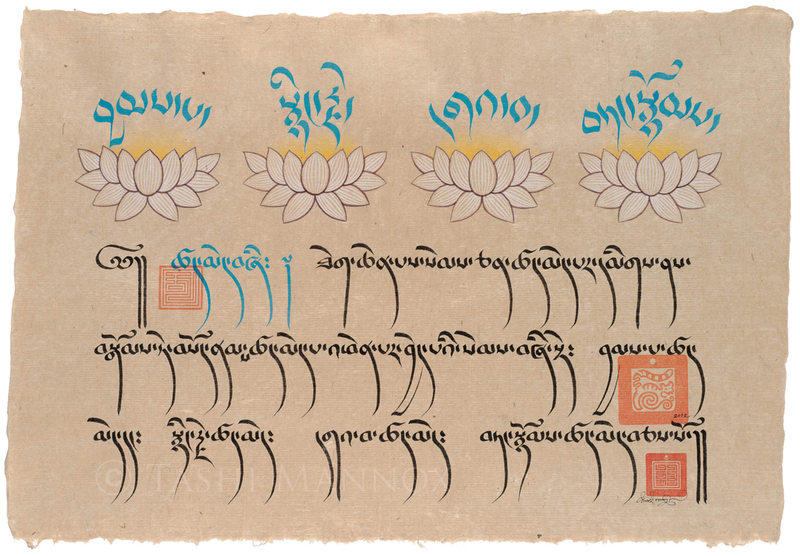 In Eastern iconography, the lotus flower is symbolic of purity and is considered an analogy of transformation as one tames ones own negative emotions that fuels a positive change. As the more rich and foul the composting matter at the bottom of a pond, the more it nourishes the most glorious of flowers, that stand proud and pristine above the water surface, un-splashed by the (Samsaric) bustle of pond life. 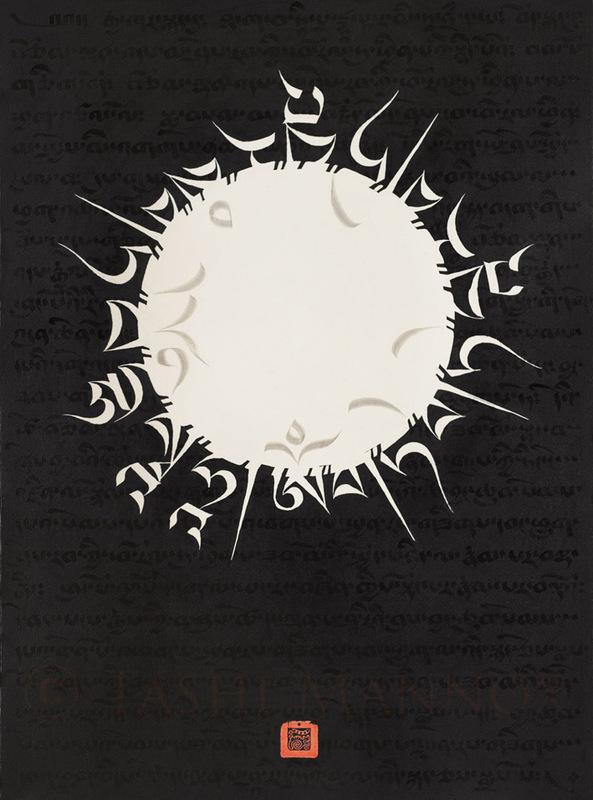 Chinese ink, gesso and silver leaf on mounted board, Tashi Mannox 2002. During the world famous Hay Festival of literature and the arts situated below the majestic Black mountain's of the Brecon Beacon National Park. 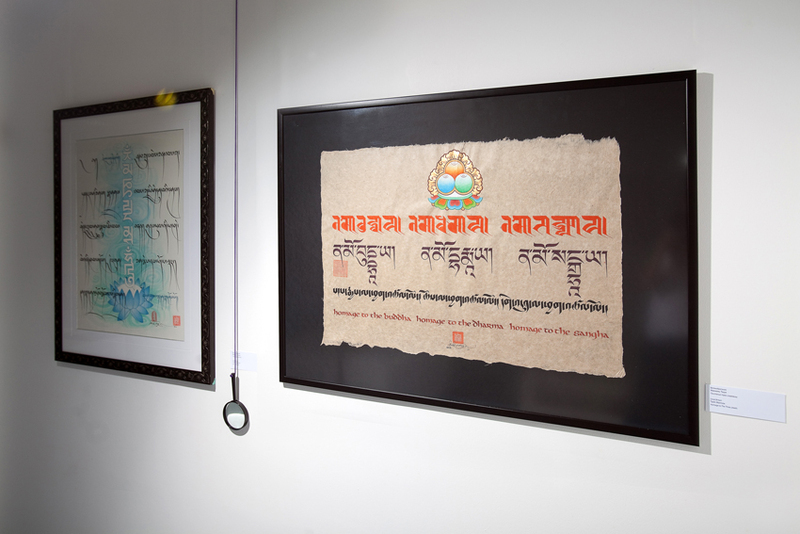 In celebration of the opening of the Richard Booth’s cinema, premieres an exhibition of contemporary Tibetan Calligraphy by Tashi Mannox. 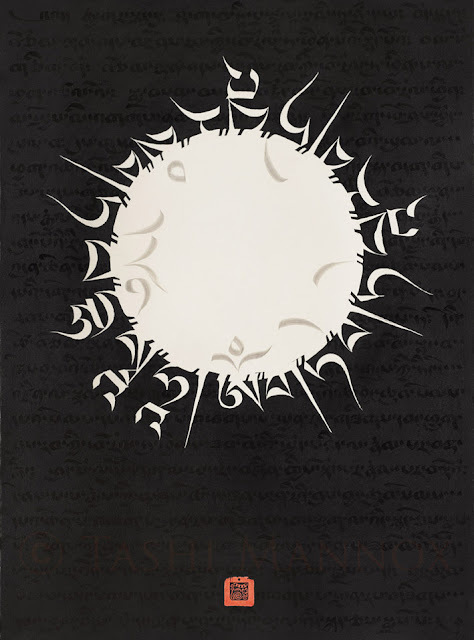 The exhibition called ‘illuminated insights’ spans the last decade of Tashi’s calligraphy masterpieces, that shows a selection of his works including the large and rarely exhibited iconographic ‘Soulhouette’ pieces. 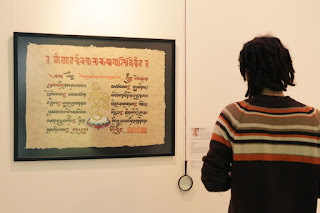 Others shown are the more traditional calligraphy artworks that illuminate the wisdoms of Tibetan Buddhist themes, such as ‘The Four Contemplation’ series, as well as small insightful gems that Tashi has brushed in the various Tibetan script styles to delight the eye and stimulate the mind. 'Male Soulhouette' Chinese ink on a scroll of heavy water-colour paper, 114 cm x 206 cm Tashi Mannox 2002. 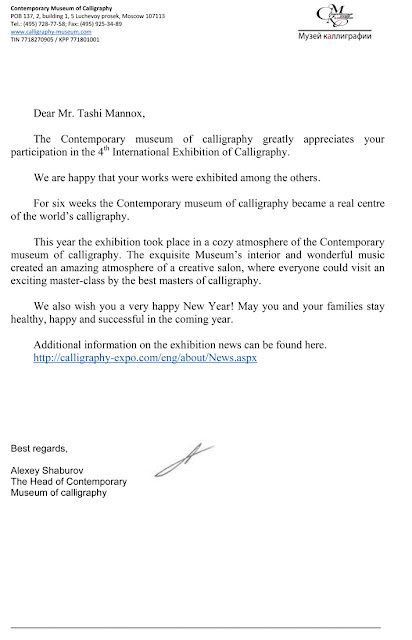 A short account of Tashi's visit to the Art & Cultural Emirates Sharjah. 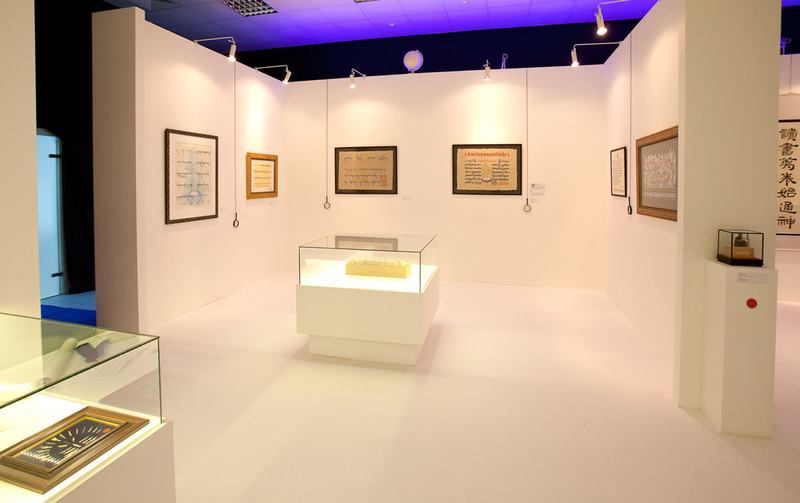 Every two years the government of Sharjah holds a prestigious event called the Sharjah Calligraphy Biennial. 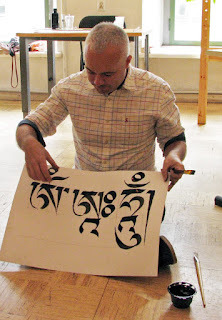 For the second term running Tashi Mannox has been invited to exhibit his contemporary Tibetan calligraphy along-side not only Islamic calligraphy works from across Arab world but from other international destinations. This year Tashi attended the opening celebrations where he met with eminent Sheikhs and other participants from Japan, Morocco, Norway and the USA. More than a 100 works by 160 artists is showcased during the month of April 2012 at the Sharjah Calligraphy Biennial that is located at the Calligraphy Square Museum and the Sharjah Art Gallery. The opening ceremony was held in the named 'Calligraphy Square' (as above) in the old quarter of Sharjah away from the metropolis of Dubai in both distance and in contrast. 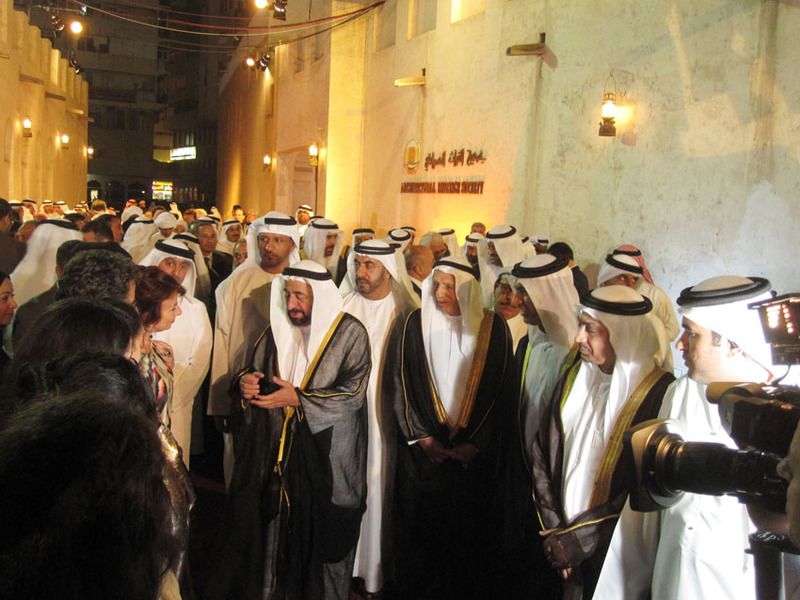 The Sheikh of Sharjah and his entourage arriving to meet the artists. H.H. Sheikh Dr.Sultan Bin Mohammed Al Qasimi presided over the opening, taking time to see each exhibit and meet with many of the participants. Known in short as the Sheikh of Sharjah, the Sultan who is the crowned prince and deputy ruler of Sharjah; is a great believer and promoter of the arts and cultural values of his own traditions as well as encouraging a multi cultural dialogue. Indeed if it was not for his openness and generous attention to such values, there would not be such an opportunity of such a dynamic and vibrant show of works at the Biennial as well as other events across Sharjah. It is little wonder of the enormous love and respect entrusted by his people, that for the past decade or so the Sheikh of Sharjah has established Sharjah as the Emirates of culture as well as the building of the vast University City that boasts excellent facilities equaled if not bettered than universities of the Western World. Tashi meets the Sultan of Sharjah to introduce his artworks. Exhibited alongside other Islamic masterpieces in the exhibition hall of traditional calligraphy are Tibetan calligraphy works by Tashi Mannox. 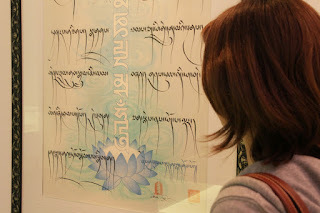 "the Great Perfection of Aa"
Another of Tashi's works called "The Ultimate and Relative Truths"
With over a thousand exhibits it would be impossible to show all the artworks on this short blog post, but there were many breath-taking and outstanding Islamic calligraphy pieces, below are just a few examples. 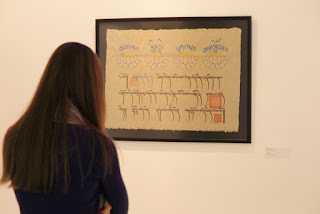 "Prayer" Islamic Calligraphy by Mustafa Falouth, Morocco. "If words could kill" by Ayad Alkadhi, Iraq. Meeting with other international artist participants, from left to right: Japanese Sugi Yayoi and Takenzawa Gyokurei, Julia Vance from Norway, Tashi Mannox from the UK and Imada Tokudou from Japan. The Japanese calligraphers went on to lead a workshop in painting giant calligraphy with huge brushes, an account of this activity can be seen here. Sugi Yayoi stands next to one of her masterpieces, a poem that resembles a garden with the sun above. Imada Tokudou with Tashi, flanking his Japanese calligraphy that reads "inner strength". The young and talented American Ebon Heath explains his 'mobile' calligraphy to a Noble Sheikh at the opening of his solo exhibition. More of Ebon's poetic works can be seen here. Another solo exhibition is from Lalla Essaydi of Morocco, who combines Islamic calligraphy with the female form producing evocative photographic pieces. More of her works can be viewed here. 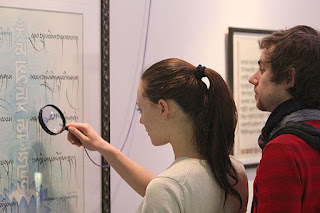 Award winning Farah Behbehani from Kuwait explains her calligraphy "Tree of Life" to the Sheikh of Sharjah. "The whole experience visiting Sharjah was a real eye opener to just how multi cultural and willing the Emirates are. In our present times of world politics and extremists, it is refreshing and heart warming to know that there is an organization such as the Sharjah Art and cultural department who contributes to bridging gaps between cultures and faiths, bringing together artists from around the world under the same desert sky. While i was there, i had a distinct feeling of the equanimity of all people, regardless of their belief, in a way that made the world seem very small, but positively as brothers and sisters in one united family. I was made to feel very welcome, the warmth and openness of the people of Sharjah in general was comforting. The organizers and helpers of the Sharjah Calligraphy Biennial where most friendly and helpful. I wish to especially thank H.H. The Sheikh of Sharjah, and my coordinator Moza Ali Al Shamsi for all her work in helping make my participation possible, plus a big thank you to the team of helpers such as below with a "beard of perfection" i ever did see! and to Radhwan who chauffeured me around to all the different events with a big smile"